The following article is published by the Biodynamic Association as a pamphlet for parents. Excerpted from Cooking for the Love of the World, Awakening to Our Spirituality Through Cooking and Cooking for and with Children, Preparing for the Life of the Future, by Anne-Marie Fryer Wiboltt. 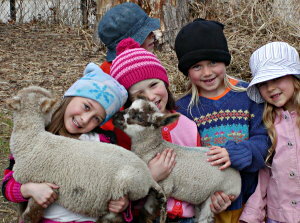 Anne-Marie is a Waldorf class and kindergarten teacher, biodynamic farmer, author and nutritional counselor. She has taught nutritional cooking and counseled for 25 years in her homeland Denmark, Europe and the United States. "May I please have some more of everything?" is a typical question asked around our table. Everyday we cook simple, hot delicious meals which includes a nourishing soup, a variety of whole grains, locally grown vegetables and seasonal fruit, beans, fish, eggs from free range chickens, meat from grass fed animals, fermented foods, high quality oils and fresh local butter. The nutritional aspects of child development and education are of greatest importance. A diet of wholesome, seasonal foods supports clear, open and positive thinking, a healthy inner life of feeling and strong motivation to fulfill our life's tasks and purposes. During the years through high school the children grow and develop into young adults. The opportunities we give the children to be nourished in body and soul, lay the foundation for becoming healthy, self-motivated, confident, caring citizens in the world. The future health of humanity and the earth depends largely upon what we offer our children. When I cook and make meals for children my wish is to use the very the best quality ingredients within an affordable budget. To really understand the essence of nutrition requires the courage to re-imagine the world and bring to our consciousness a view other than the purely material. The quality of our food, and especially life forces of the meal we eat, is of greatest importance in the light of healthy child development. What distinguishes biodynamic farming from other healthy farming practices such as permaculture and organic farming is that biodynamic farmers consciously think and work in a practical way with these earthly and cosmic forces and rhythms. Sowing and harvesting are carefully done at the most favorable times in relationship to the sun, moon and planetary rhythms. In addition to working with the cosmic rhythms, applying biodynamic preparations and composted cow manure, these farmers also maintain healthy soil by rotating crops, incorporating plenty of organic matter and other holistic agricultural activities. Whenever possible I use organic or biodynamic foods that are locally produced. Seasonal, locally grown foods harmonize with the environment we live in and resonate with the life forces and seasonal changes around us. Eating seasonally and locally is traditionally what people all over the world have practiced. It is only recently that we have been able to ship foods around the world at any time of the year. Cooking with seasonal foods encourages a healthy relationship with nature and life itself. I always strive to get the highest quality food when cooking for children while at the same time keeping the cost affordable. I instinctively know that smaller amounts of nutritious food are much healthier than large amounts of 'empty' food with no life. I base my menus on whole foods, which are cheaper to produce than processed, refined foods. Although many organically or biodynamically grown foods are more expensive than conventional foods I do not mind paying a little more for higher quality food. We gladly place our money in the hands of farmers who care for the health of the earth and humanity. Buying locally ensures a minimum of shipping and packaging, since food does not have to be transported long distances across the country. I like to support a healthier local economy where the funds stay in the community. In the long run buying high quality whole foods locally, seems to be more affordable and sustaining for everyone. Eating a diet of wholesome foods encourages a wholesome relationship with the world we live in. This is perhaps the most important aspect of healthy nutrition for children. Whole foods ensure superior quality and at the same time nourish respect and appreciation for the mystery of life. When I cut an apple around the middle so that a star appears, I hear a sigh of wonder and awe from the children. Inwardly I marvel at the wisdom that created this magnificent fruit. Small gestures like this completely change our relationship with the world and create the deepest reverence for all life. When working in the kitchen or nature enter this mood of wonder. Take your children to visit a farm or grow a few plants at home in the garden or in flower box. Herbs and quick growing lettuces do well in a sunny windowsill. Whenever I plant a seed in the ground I am in awe of the plant cycle that I experience; the transformation from seed to leaf to bud, blossom, fruit and back to seed. I am amazed that a sunflower seed blossoms within weeks into a sunflower, greeting the sun on its journey across the sky. Only a sunflower will grow from that seed, not a squash or anything else! What a miracle! My assistance in this process is humble. I nurture the plant with rich compost and make sure it has water. Then I watch the plant with the utmost interest and attention. When it is time to harvest, it is with the deepest respect and appreciation that I reach out in joy to pick the food. As human beings we are intimately connected with these rhythms. Rhythm is strengthening and very essential for the development of a healthy life no matter what age we are. Young children thrive and feel safe when the world around them flows rhythmical and is predictable. Everyday we eat lunch and dinner at the same time. We have the same 'meal rituals'; lighting a candle and singing a grace. A healthy rhythm of sound sleep, various nourishing activities and wholesome meals is a treasure for any child. 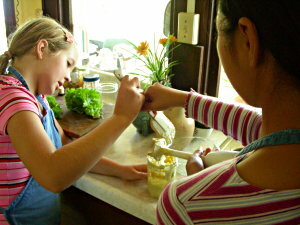 Another important aspect of healthy nourishment for children is immersing them in nourishing activities. It is wonderful for children if they can participate in family and domestic activities like gardening, cooking and setting the table. 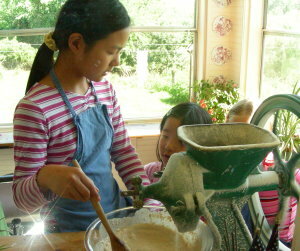 In addition when children are responsible for age appropriate chores they develop a sense of purpose in the world. Oral story telling, painting, drawing, modeling, music making, imaginative play and other artistic activities nourish active inner creativity, healthy social skills, complete brain development and strong bodily coordination as well as self-motivation and confidence. When children are allowed to play out of doors they exercise, climb, run, jump, walk and explore the changing world on their own accord. Besides enriching their whole being and laying the foundation for academic learning these activities also promote a strong appetite and sound digestion. The atmosphere wherein the meal is shared is part of healthy nutrition as well. When the mood is relaxed, warm and light-filled we can fully digest the meal. A calm, joyous feeling around the table encourages respect for one another and nature from which we receive our food. Children grow and develop healthily in a warm, safe and loving environment. Children of all ages blossom and flourish when they are warm. If they are cold they have to use their inner activity to stay warm instead of developing in body and soul. A loving warm environment, warm clothing as well as warming foods and cooking styles are fundamental for the growing and evolving child. Starting the day with a hot bowl of oatmeal drizzled with oil or butter is very different from a serving of cold cereal with milk and fruits. It is a gift for children if they can develop a taste for natural foods. It may take some time to change old habits. After an active morning outside climbing trees, running in the field and digging in the ground the appetite is high. Almost everything tastes great when the children are really hungry. When children also are involved in some of the processes of growing and preparing food they are much more likely to appreciate the meal in front of them with joy. Most often they will try anything that they helped prepare. I always ask the children to eat a 'polite bite' so that they have a chance to cultivate a liking for new flavors and textures. The most supportive I think, to help children learn to like new foods, is when their friends or family around the table eat the meal with the greatest delight. Children delight in simple, beautiful meals. Younger children most often prefer a little piece of broccoli, perhaps with a light dressing and a beautifully cut orange carrot flower, over an exotic vegetable pate. Of course older children, especially in the teenage years, desire a lot more zest and creativity in cooking as well as in their lives in general. A simple, beautifully prepared meal allows our senses to feast on a variety of colors, textures, flavors and aromas and is a significant aspect of nourishing foods. When I create a family meal I generally include a nourishing soup, whole grains, protein rich foods, vegetables - especially leafy greens vegetables, high quality oils or fats as well as small amounts of fermented foods. I cook simple, wholesome and beautiful dishes with a wide selection of foods using a variety of different cooking styles. Everyone at the table eats the same meal. For younger children I may set a little food aside before using any seasoning. Because children are growing and developing I make sure to serve rich, highly nutritious dishes with buoyancy and lightness. The amount I serve of grains, vegetables, animal foods, oils and fats, desserts etc. vary with everyone's needs, the activities of the day as well as the season. Everything is always changing. Life is dynamic. Soups are a wonderful and satisfying entrance for the meal. I create light, refreshing and cooling soups for spring and summer or when the rest of the meal is substantial. Heartier, warming soups, emphasizing round and root vegetables are nourishing for the fall and winter days. I use rich soup stocks cooked on bones of beef, chicken, fish (including heads and tails) or sea vegetables like kombu and wakame. Some soups are a meal in itself served with fresh sourdough bread and butter or olive oil. Grains are very special seeds, indeed little golden gems, ripened in the abundance of light and warmth of several seasons. Hidden within the sheath of each grain is an ordered little cosmos of its own, totally independent of its mother plant, capable of producing thousands of new grains in years to come! There is nothing like the wholeness of grains. These lovely grains, when prepared well, have a delicious, sweet flavor. Explore cooking with a wide variety of grains like wheat, rice, oats, millet, rye, barley and corn. For better digestion soak whole grains in water for at least 6 hours with an added dash of liquid from natural fermented foods, such as whey or vinegar. Dry cereals are processed in such a way that they are not healthy to eat. When baking bread, use sourdough and freshly milled flour. Yeasted and chemically leavened (baking powder and baking soda) breads are lighter and quicker to make occasionally but no comparison in quality and digestibility. Served as part of a meal and chewed well, whole grains are a very essential part of a child's diet. When cooking a main meal, I make several side dishes of freshly cooked, seasonal vegetables. I pick a wide selection of roots, leafy greens, fruits and seeds in appropriate proportions, using a variety of cutting and cooking styles. Qualitatively all parts of the plants are different. The root has its life in the moist soil. It hugs the earth and penetrates into its dark, cool, watery mineral rich realm. Leafy vegetables on the other hand have, compared to roots, a closer relationship to the cosmos. The cosmic forces lift the plant out of its earthly gravity into an expansive upward movement creating a wealth of lighter, less substantial beautiful leaves. A variety of seasonal green, round and root vegetables as well as colorful fruits, cooked in a variety of ways are essential in a healthy diet. I serve at least one protein-rich dish at every meal. These include beans (lentils, chickpeas etc), bean products (tofu and tempeh), fresh or frozen fish (preferably wild or farm raised organically), free ranged poultry, eggs, meat from grass-pastured animals, or unprocessed, unhomogenized milk and cultured dairy product, like yogurt and raw cheese. I rarely cook with dairy products, except for butter, since the pasteurization completely changes the quality and makes them difficult to digest. Fresh, unprocessed or cultured dairy, fish or animal foods have been part of many different cultures dietary heritage. To either exclude or include animal foods and dairy in the diet and to decide the appropriate proportion is a personal choice that must be seriously considered. If you choose to omit animal foods from your child's diet make sure to include high quality oils and unprocessed, cultured dairy along with dishes that include sturdy downward growing roots and strengthening cooking methods. When including animal foods in the diet choose meat from animals that have been free-ranged and pasture-fed (healthy fish need wild sea grasses as well). Soybeans are best only eaten in the form of miso, tempeh and occasionally tofu seasoned with soy sauce. Before many plants wither and decay they develop mature seeds. Seeds embody the life of the next generation. They are the culmination of the beginning and the end. These small, rich and oily gems are highly concentrated and full of potential vitality. Healthy oils and fats are very important in a child's diet. Most plant oils go rancid quickly after being pressed. Therefore I choose only unrefined, cold pressed extra virgin olive, freshly pressed dark sesame oil, freshly ground peanut butter, freshly churned butter and high quality animal fats. I complement one meal a day with a small amount of cod liver oil as well as fish oil, seasoned with lemon essential oil. I often sprinkle freshly ground flax seeds, roasted sesame seeds, sunflower seeds or various freshly shelled nuts on grains, salads and desserts. When cooking for children I season the meals lightly using mainly herbs. In my garden I grow a variety of herbs like rosemary and thyme. All winter I pick many of the same herbs fresh from plants growing in pots on my enclosed sun-bathed porch. Other natural seasonings that I use regularly are naturally fermented apple cider, rice or balsamic vinegars, fresh cold pressed olive oil, dark roasted sesame oil, cultured butter, fresh ground nut butters, zesty mustards, sun dried unrefined sea salt, and traditionally fermented and aged tamari and tamari soy sauce (shoyo), miso, umeboshi plums and umeboshi vinegars. I add small amounts of sea vegetables, like kombu as a bean tenderizer and natural flavor enhancer. The ways in which I prepare vegetables and grains bring out their natural sweetness. The whole meal itself is naturally sweet. The other major flavors, salty, pungent, sour and bitter, are present without dominating the delicate flavors found in whole foods. Serving small amounts of fermented, cultured or raw food with each meal is pivotal in creating a well-balanced nutritious meal. They especially increase the appetite, stimulate the digestion and make any simple meal festive and satisfying. When I began serving sauerkraut I didn't anticipate how much the children liked it or rather naturally craved it. People of all cultures enjoy fermented and cultured foods. The Greeks pickle olives, Germans turn cabbages into appetizing sauerkraut and the Japanese transform green, immature plums into the tasty medicinal umeboshi plums. Grains and beans are cultured in the Far East creating the now well-known nutritious miso and tamari soy sauce. In Indonesia many families culture soybeans to create tempeh. All over the world people ferment grains or fruit into vine, beer or vinegars. From Scandinavia and Russia came the tasty drinks kvass and kombucha, which kept young and old healthy, and satisfied the need for fresh foods throughout the long winters. Nearly everyone in our society is familiar with cultured yogurt, butter, kefir and cheese. Most of the time I create a balanced meal that is complete and satisfying without a dessert. A balanced meal in itself is naturally sweet, colorful, and flavorful and includes a variety of textures, cooking styles and cutting techniques. Adding fermented foods to the meal bring all the dishes to a unified whole, and aids in digestion. Although a balanced meal is complete and satisfying by itself it is important from time to time to make healthy, rich and nourishing treats and beverages for children. Sweeteners are very concentrated (forty quarts of maple sap make one quart of syrup) so I use them in small amounts. My favorite natural sweeteners are maple syrup, sorghum, barley malt, rice syrup, raw or cooked fruit and fruit juices or concentrate. I use raw, unpasteurized honey in dressings and dishes that do not need to be heated.